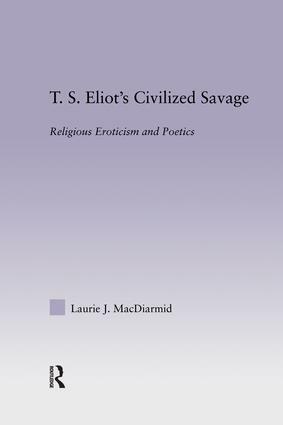 T. S. Eliot's Civilized Savage revisits this poet's drafts and canonical poetry in a sometimes dismissive critical arena . While contemporary readers emphasize Eliot's charged personal life, his anti-Semitism, his political conservatism, and his misogyny, Laurie MacDiarmid argues that although Eliot's poetics are shaped by private fears and fantasies, in many ways these are the ghosts of a culture that accepts and celebrates him. Comparing early versions with finished poems, this book explores the development and ramifications of Eliot's 'impersonal' poetic without losing sight of his influential, haunting work. Examining Eliot's neurotic relationship with women and his escape into women and his escape into spirituality, this book observes how Eliot conceived and eroticized poetry of worship and a poetic that dictated a sacrificial relationship to a savage God.